MINNEAPOLIS – Amidst a trilling of trumpets, a shower of stoles, and a grateful congregation’s affirming applause—interposed with the shedding of more than a few tears—Lisa Larges, a candidate for the ministry of Word and Sacrament in the Presbyterian Church (U.S.A.) since 1986, was ordained as a teaching elder at the Lake Nokomis Presbyterian Church. Larges, who received her M.Div. with honors from San Francisco Theological Seminary in 1989, where she was also a recipient of its preaching prize, has been called to serve the small, suburban Minneapolis congregation as its associate pastor for Congregational Care. 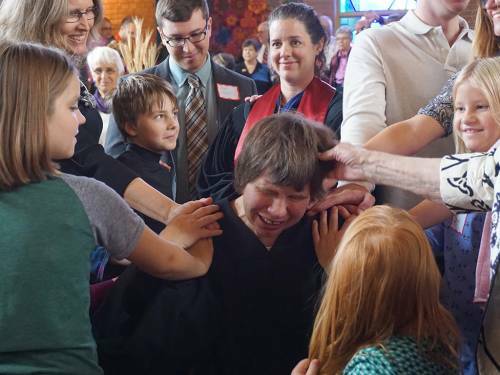 At once a historic occasion and a joyous celebration—30 years in the making—Larges’s ordination called the gathered body both to remember and to hope, not least Larges herself. A lifelong Presbyterian, Larges had become a candidate for ministry in the Presbytery of the Twin Cities Area in 1986. 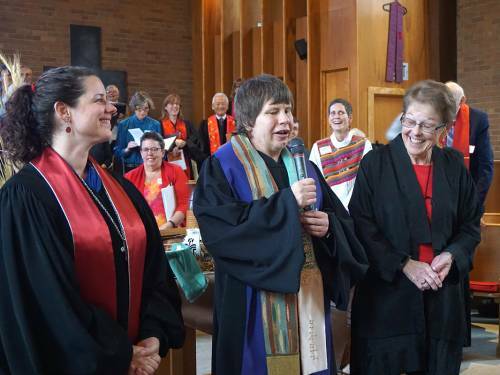 Because she felt as a matter of conscience that she could not serve the church without being open and honest about her identity as a lesbian, Larges “came out” to the presbytery’s Committee on Preparation for Ministry in 1991. Thus began a long judicial process and a protracted season of discernment for Larges, which did not lead immediately to ordination as a teaching elder, even after the 219th General Assembly (2010) of the PC(USA) removed the church’s constitutional barrier to ordination for all who are called and qualified regardless of sexual orientation or gender identity. The assembly’s action, which was subsequently ratified by a majority of presbyteries, took effect on July 10, 2011. In the scriptures—Jeremiah 32:1-15 and 1 John 4:17-21—hymns, anthems, presbytery commission members, and worship leaders that were chosen for the service, it was clear that the long-awaited day was all about love. In her sermon based primarily on the Old Testament text, Mardee Rightmyer, director of Christian Education at Eastminster Presbyterian Church, Stone Mountain, Georgia, spoke of how the prophet Jeremiah showed his complete trust in God “by putting his money where his mouth is,” buying land in his hometown of Anathoth, which was already occupied by the Babylonians. After members of the congregation joined hands around the sanctuary during the prayer of ordination and the laying on of hands, Rutford declared the ordination as worshipers again broke out in thunderous applause. The Rev. Dr. Janie Spahr—who was described in the bulletin as “beloved friend and mentor”— followed with Larges’s charge as a newly-ordained teaching elder. Spahr is an honorably retired PC(USA) minister and Lesbian Evangelist Emerita for That All May Freely Serve, an organization founded in 1992 to advocate for an inclusive and welcoming Church, which Larges also served. “I believe that we have been holding our breath with you for 30 years, because it is so much to want things so much for the people that we love,” Spahr said. Then, gesturing toward the Shower of Stoles gracing the sanctuary—a project that “celebrates the gifts of LGBT [lesbian/gay/bisexual/transgender] persons who serve God…while also lifting up those who have been excluded from service because of their sexual orientation or gender identity”—she continued. Following Spahr’s charge, friends in the liberation movement, Downtown Church in Rochester, New York, members of Larges’s family—including her father Gene, a ruling elder at Knox Presbyterian Church and a member of the commission to ordain—and members of the Lake Nokomis Church poignantly presented Larges with symbols of ministry, including a handmade Communion set and stoles. The Rev. Dr. Jeffrey S. Japinga, transitional executive presbyter for the Presbytery of the Twin Cities Area, who was unable to attend the ordination, commented on the service’s significance. Japinga recalled the presbytery meeting in September at which Larges was examined and approved for ordination as a teaching elder, noting how inspired everyone was by her. Also present when Larges was examined and affirming her gifts with both the written and the spoken word, was the Rev. Beth Hart-Andersen, a teaching elder member of the Presbytery of the Twin Cities Area who attended the ordination. “How sad as a church that we were robbed of this—robbed of Lisa’s intellect and of what she shares in words that are tangible, winsome, and loving,” she said. Like Japinga, the PC(USA)’s co-moderators, the Rev. Jan Edmiston and the Rev. Denise Anderson, were unable to be present. They instead send video greetings with words of blessing and congratulations for the newly-ordained Larges. The Presbyterian Mission Agency was represented by Ruling Elder Tony De La Rosa, its interim executive director, who not only attended, but also sang in the choir.